Is it worth spending for a phone that has a shatterproof display but offers no spectacular features? Motorola has upped the ante in terms of durability, with its latest flagship, the Moto X Force, called the Droid Turbo 2 in the US. The smartphone is available India with a price tag of ₹ 49,999 (32 GB) and ₹ 53,999 (64 GB). Interestingly, this is going to be the first Motorola smartphone that will be available at Croma and Spice Retail’s offline stores, as well as on the Web through Flipkart and Amazon. Usually, all Motorola smartphones in India are initially available exclusively on Flipkart. The key highlight is the shatterproof display, but we aren’t sure if that justifies the huge price tag. The Moto X Force’s 5.4-inch AMOLED display offers a screen resolution of 2,560x1,440p. This is in line with what one expects from a top-of-the-line flagship smartphone. The company claims that it is more rugged than other smartphones in the market, thanks to the five-layer screen which boosts durability and prevents the display from shattering. And while the phone did stay true to its promise and did not break when we dropped it on a concrete surface from a height of 3 ft, it is as vulnerable as other smartphone screens when it comes to scratches and dents. This is unexpected for a phone which claims to have a shatterproof display. In terms of performance, the 2K resolution display is on a par with other high-end flagships. The text and colour reproduction is very good, and that makes the screen perfect for gamers and movie buffs. There is a feature called attentive display which won’t let the screen go off or dim as long as you are looking at it. This is useful for users who like to read a lot on their smartphone; they won’t have to deal with the display switching off midway through an article. The Moto X Force’s back panel is made of stitched fabric of ballistic nylon and has a slim but sturdy metal frame on the side. The combo gives the device a unique appearance and rugged feel. But for some reason, it does not really have the aura of a premium flagship device. We have seen something similar in the Moto Turbo, launched last year. One has to be a bit more careful as the fabric finish catches dust and dirt quite easily and is not easy to clean. The Force’s back is flat, and the curves appear more towards the edges. It is 9.2mm thick and weighs 169g, yet keeps the size in check and feels more like a 5-inch smartphone than a 5.4-inch screen device in the hand. The speakers have been placed on the front for better audio effect, while the SIM slot is at the top. Motorola has used Qualcomm’s most powerful Snapdragon 810 octa-core processor and has paired it with 3 GB of RAM. Though the processor has a tendency to heat up when stressed, we didn’t notice any heating up on the back or edges while using the Moto X Force, as Motorola has used an under-clocked (2.0GHz) version of the chip. Switching between apps and multi-tasking worked smoothly, and this phone will not disappoint power users or gamers. The 3,760mAh battery provides a full day’s backup at most, which is not surprising considering the Snapdragon 810’s issues with power consumption and heating. It has Android 5.1 (Lollipop) and comes with a standard set of Google and Motorola apps. The stock Android interface looks a bit bland and has hardly any customization features in it. However, there are some interesting elements like the voice control feature, Moto Assist and the always-on display that shows time and notifications when you wave your hand over the display. Though it comes out of the box with an older version of Android, the prompt to update to Android 6.0 (Marshmallow) shows immediately after connecting the device to Wi-Fi or 3G/4G. There are no third-party apps or themes that may interfere with user experience. The smartphone’s 21-megapixel camera has a basic interface. However, it doesn’t have manual focus, something seen across all Motorola phones. So you have to rely on the auto-focus to get it right. There are no filters or modes and all the elements are placed in a circular wheel hidden on the left side of the screen. The camera is fast and takes crisp shots during the day. The colour reproduction is rich and natural. Even in frames with multiple bright colours or multiple light sources, there is good contrast. Pictures clicked in low-light look a bit washed out and hazy. The Moto X Force’s prime attraction is the shatterproof display, but from what we experienced, it shouldn’t be the reason to invest in this phone. At the current price, the Apple iPhone 6s Plus ( ₹ 58,000 for 64 GB) is a better bet as it offers superior looks, a superior camera, fingerprint sensor and a better battery. 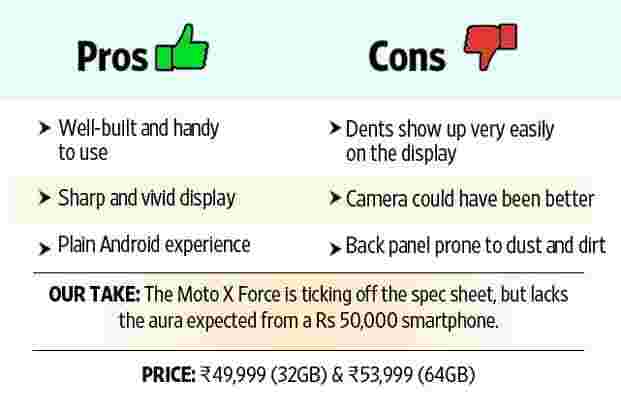 And in case you want to stick with Android, the Moto X Style ( ₹ 29,999) offers similar performance at a significantly less cost.